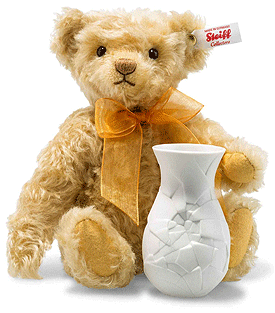 Sunflower Teddy Bear with Vase by Steiff. A beautiful limited edition Steiff item, made by hand in blond mohair. Like Rose Teddy bear last spring, Sunflower Teddy bear is here to usher in the season with a very special vase for tender blossoms. Once again, the vase is made by porcelain specialists Rosenthal ... Ever the charmer, our blond friend sets great store by stylish gifts. He wears a bow on his curly coat of finest mohair and, needless to say, a gold-plated “Button in Ear”. All that is needed to complete the picture is a bouquet of freshly picked flowers.